A couple days ago, I was thinking about Stephen King's IT, a wonderful book and a good movie. My one gripe with the film is that they should have included more. IT is a rather large book, with about 1,093 pages of material in the gnet paperback. I appreciated the movie, mainly for Tim Curry's appearance as the clown of every kid's nightmares, Pennywise. I read the book when I was in fifth grade, and it had me scared of the dark, the bathroom, the basement, and, of course, gutters for almost a full year. Even though the parts with the clown were were creepy as hell and still scared me, I felt some of the scariest parts were in the interludes, where Michael interviews some citizens of Derry, Maine. One man talks about how his daughter went into his basement and soon after, he heard what sounded like either a laugh or a scream, and when he went down there, his daughter was gone (correct if I'm wrong; I haven't read IT in a long time). THAT is what sent me plunging into the grip of total fear. When I started thinking about a remake of IT (with a huge run-time, like The Stand), I started thinking about how they could make this work.Then it hit me: A found-footage, mockumentary a-la Blair Witch! In my mind, here's how I would have it play out: The Loser's Club decides make a documentary about what's been going on in Derry, Maine, with the children's disappearances and all that. So they interview some citizens (like above), and some of them even manage to record their own experiences with Pennywise. 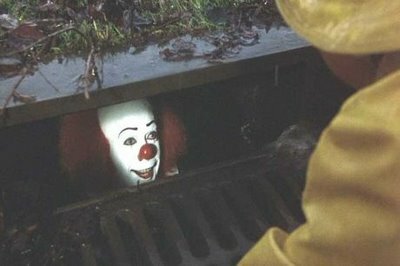 Then they head into the sewer, where Tim Curry is waiting for them...Years later, when the evil returns, they go back to Derry finish the film they started. ?w=497&amp;h=275 Let me know what you think; would you like to see IT taken in this direction? Reply below! I don't think a found footage mockumentary would work...Not without changing the source material and the attributes of what IT is and can do. I don't think IT could be captured on film.